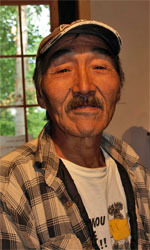 Jonas was born in 1951 at Hebron and was, as a child, among the last of the Hebron Inuit to be moved south in the late 1950's. 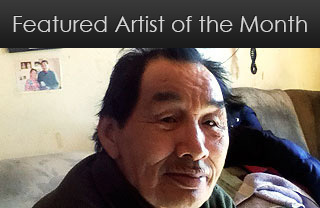 He grew up and raised a family in Nain, presently, the northernmost village on the coast of Labrador. 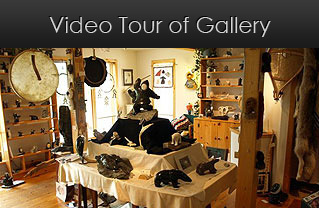 Circumstances drew him south to Labrador's larger, central town of Happy Valley-Goose Bay, where he began in 1994 to carve wood and later soapstone. 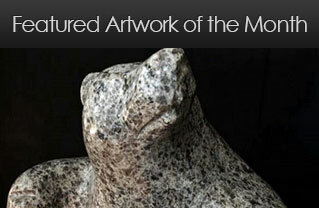 Presently, Jonas carves primarily smaller pieces in soapstone, alabaster and serpentine. His preferred subjects are the marine mammals, such as porpoises, seals and whales, found in the cold Labrador Sea, and also the Inukshuk, historic stone direction and landmarker of his Inuit ancestors.